At the northern end of the Côtes de Provence vineyards and wine producing region and surrounded by wooded hills, Entrecasteaux is one of many small unspoiled towns to be discovered in this relatively quiet region of Provence. France This Way comment: although this is one of the less visited regions of Provence it is within quite easy reach of both the Gorges du Verdon and the Mediterranean coast, and several towns with the traditional Provencal charm that is hard to find nowadays, so a good 'alternative' destination if you want to see somewhere new. The village itself is very pretty with plenty to discover and enjoy along the medieval streets, and while there are few important monuments you will come across lots of those little architectural features and pastel painted houses, vaulted passageways and cobbled staircases that give towns in Provence their own individual character. 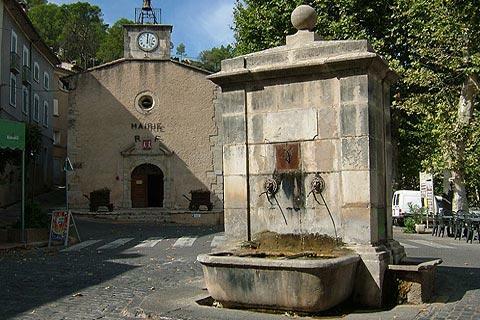 Among the religious monuments in the town you will see two roman style churches in Entrecasteaux: the fortified Church of Saint-Sauveur and the Chapel of Notre-Dame de l'Aube. At the Chapel of Saint-Anne you can enjoy a nice view across the rooftops of the town. The town is particularly known for its castle and gardens. Entrecasteaux is towered over by the chateau that stands at one side of the village and the principal tourist attraction in the town. Although it stands on the site of an earlier fortress, the castle that you see now dates from the 15th to the 17th century, with little to remind us of the medieval fortress that once stood here. 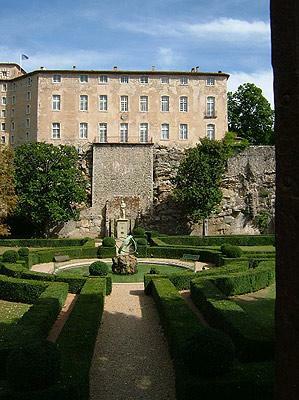 The castle itself is Provencal in style, with an exterior less ornamented than we might expect in other regions of France. Inside Entrecasteaux castle the rooms of the castle have been furnished with period furniture, tapestries and other items. 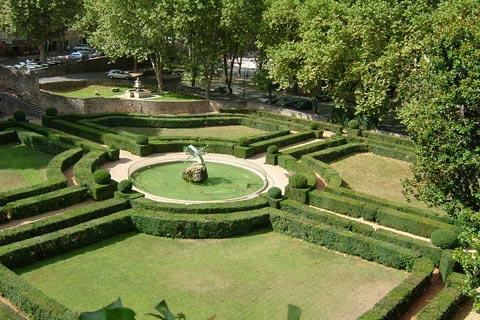 Notably, the castle gardens were laid out by le Notre, the designer who planned the gardens at Versailles. Here they are rather smaller in scale, but the formal gardens with their geometric clipped hedges are a nice backdrop for the castle. The castle is open to visitors from easter to end September (closed Saturdays), admission price eight euros. 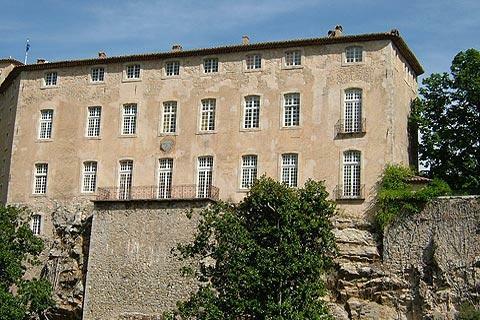 Be sure to visit the Abbey at Le Thoronet, and some of the other small towns and villages in the Haut-Var region such as Tourtour, Lorgues and Flayosc when you visit Entrecasteaux. Entrecasteaux is in the Var department of Provence, south of the Regional Natural Parc du Verdon with the famous Gorges du Verdon and about 50 kilometres inland from the Cote d'Azur at Frejus and Saint-Tropez, so plenty to see in both directions but avoiding the tourist numbers in either of these very popular areas!